West Windsor, N.J. – It was truly fitting that Gov. Chris Christie chose the Conference Center at Mercer County Community College (MCCC) to announce his continuing support for the New Jersey Scholarship and Transformative Education in Prisons program (NJ-STEP), which offers college courses and credits to nearly 500 inmates at six of the state’s 13 correctional facilities. According to MCCC Liberal Arts Dean, Dr. Robin Schore, MCCC has been in the forefront of the prisoner education movement since the late 1960s when it ran the degree-granting Prison Education Network (PEN), offering courses at all New Jersey state prisons. Schore began his career at Mercer teaching English at Trenton State Prison in 1973. The PEN program gave way to Project Inside in the late '90s, offering a certificate in Small Business Readiness, a federally funded program that ended in 2011 and was succeeded by NJ-STEP. 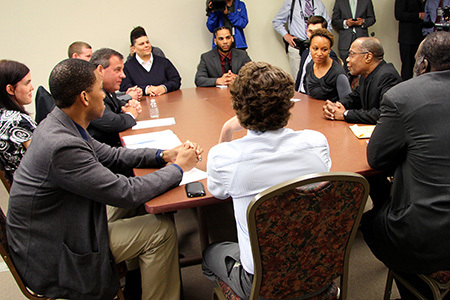 Christie began his visit with a roundtable discussion with NJ-STEP instructors and their students, several of whom are now college graduates or on their way to degrees. "You all have the potential," Christie told the five students. "It's inspiring to me and one of the good things I get to do in my job." NJ-STEP instructor Kesha Moore, a professor at Drew University, added that the experience is inspiring for her as well. "They teach each other and they teach me. It's challenging, but thrilling." The closed session was followed by a press conference that featured remarks by Patricia C. Donohue, MCCC President; Alvyn Haywood, MCCC Associate Professor of Communication and long-time instructor in the prison program; former inmate Benjamin Chin, a program participant who graduated with honors; Mitty Beal, Executive Director of the Sunshine Lady Foundation; and Todd Clear, Provost of Rutgers University – Newark, where NJ-STEP is based. Currently, Mercer teaches approximately 80 prison classes each year. Among MCCC's full-time faculty and staff who have taught in the prisons over the decades are Alvyn Haywood, Carlo Alfare, Ken Howarth, Don Reichman and Barbara Jefferson, along with many faculty emeriti, and numerous adjunct professors and volunteers. Gov. 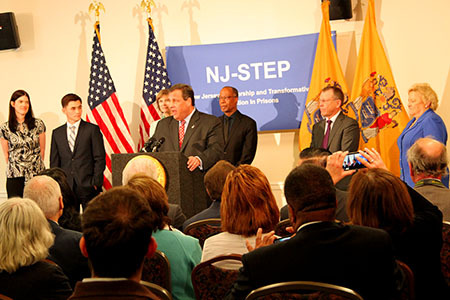 Chris Christie endorses the NJ-STEP program at the MCCC Conference Center. Also pictured are, from left, NJ-Step's Director, Margaret Atkins, Benjamin Chin, a program participant who graduated with honors, Mitty Beal, of the Sunshine Lady Foundation, MCCC faculty member and prison instructor Alvyn Haywood, Rutgers-Newark Provost Todd Clear, and MCCC President Patricia C. Donohue. Gov. Chrisite, leaning forward at left, speaks with MCCC faculty member Alvyn Haywood, who has taught in New Jersey's prisons since the 1990s. The Conference Center provided live streaming of the press conference to prisoners at several facilities.